Other than saying goodbye to my grandparents (who made is safely back to Nashville), this past week has been so much fun. Miles and I spent nearly every day with my sisters, who are still on summer vacation and often looking for something to do. Right now I'm enjoying my miniature summer break- the fall semester starts a week from tomorrow- and so it was nice to not worry about having homework to do! We went swimming, played volleyball, and went to the mall to see if there was anything to catch our eye. I love those two little goofballs. 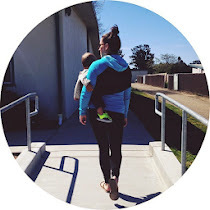 This week was huge in the motherhood category. 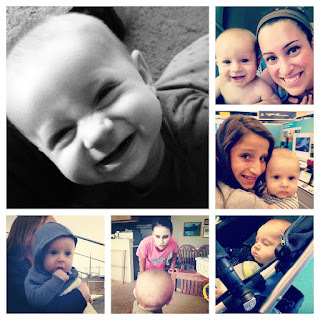 Miles has gone from saying, "Mamamamama" to purposefully saying, "Mama!" It is the sweetest, most precious sound to my ears (although it's heartbreaking when he says it when he doesn't want to go down for a nap and I can hear a sad little, "Mama...mama..." coming from his room). Another new thing this week is that Miles will fall asleep right whenever he is tired, rather than waiting for a bottle, crib, and his usual ritual. This week, my friend Morgan and I (and of course our crew of littles) went out to lunch. As we were sitting there eating, I look over right as Miles eyes had drowsily closed and he'd fallen asleep. 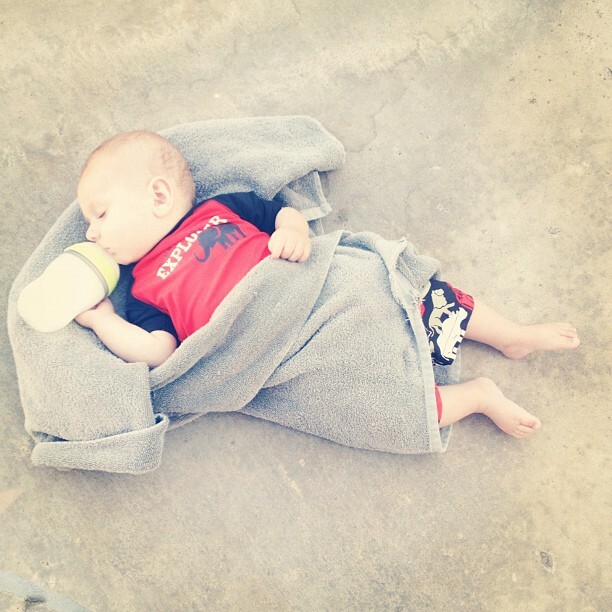 He fell asleep after going swimming yesterday- I had just laid him down on a towel with his bottle and he was out, right in the middle of all the commotion at the pool! And today, he fell asleep as my mother-in-law was holding him (usually it's more of a fuss for him to settle down to sleep than this!). I always say, "Oh, he must be going through a growth spurt!" but lately it seems like a good excuse, since he's just been needing extra sleep for something. My growing boy! How adorable is Miles asleep in his towel with his bottle! So precious. I love watching little ones sleep! And yay for intentionally saying Mama even if it's a sad one ;). Enjoy this week off before classes! Hi. Stopping by as part of Operation Fabulous. Hi stopping by from operation fabulous! new follower from operation fabulous. Too cute...Your newest follower from Operation Fabulous! I'm your newest follower. Found you from Naptime Review! Follow back if you get a chance :) Cute kids! !